It has been a long road to the CDT. It started in 2016 with discussions with EPSRC and the plan to prepare a joint bid with Birmingham with Glasgow leading, specifically myself ‘volunteering’ to lead the bid. Then, in 2017, EPSRC announced the long-awaited CDT competition, and we faced university level triage. Glasgow was permitted by EPSRC to submit 10 outline bids and had 20 potential CDTs and so the Dean of Research in the College of Science and Engineering led the triage and lifETIME was selected to submit a bid to EPSRC’s outline stage – so already a 50% attrition rate. Preparing the outline bid was a lot of work as we had to make a strong case for the national need for new talent in the area. In other words, EPSRC wanted to make sure they were training students for whom there was a growing job market and bright prospects. This need is evidenced by the pull from industry for new talent and so the race was on to get industry and other stakeholders (NHS, charity, cell manufacturers, funders and regulators – all sectors that would have demand for our graduates – as well as, of course, academia) to support our bid. It was at this time that Aston joined us as their skills in bioprocess engineering were needed and also that we noticed that Science Foundation Ireland were willing to co-fund studentships. That SFI were a possibility was very interesting for me personally as my first PhD student, Manus Biggs, is a lecturer at CÚRAM in Galway and also we are good friends with Abhay. So, partners in place, stakeholders engaged, we passed the outline stage and could proceed to full proposal – another 50% of bids had gone and the competition was starting to feel tight. For the full proposal, we had to fully demonstrate stakeholder engagement through leverage funding from industry. To do this we had to act very quickly and decided, thanks to Ivan at Aston, to organise an industry day at Glasgow. This was the masterstroke, it worked really well, engaged our stakeholder partners fully into the process, attracted industrial funding and strong stakeholder involvement in the CDT. Working across universities to put the training provision together was interesting. This provision is key to being a CDT. A CDT is more than a PhD – it is the chance to do a PhD and also to receive the professional skills employers will want to see and to develop a cohort that will help each other to build a new sector in the UK – in our case a sector that will change the way we screen new drugs through regenerative medicine, sensor and microfluidic technologies. Full proposal submitted, we just had to do the interview. First were the mock interviews to get us ready. In Glasgow, Manuel and myself asked Richard Cogdell FRS to ‘warm us up’ with a few questions – he pretty much wiped the floor with us, but that was fine as this was the start point of the preparation process. Then, Manuel and myself went down to Birmingham for 3 hours of acting class with Paula (!) followed by a mock interview that went pretty badly – but, hey it was a first shot and it was a first go as a team. Then we did another mock, this time in Glasgow with Paula and Abhay on Skype. It went pretty badly – buy, hey this was fine as we were now really focussed on the task in hand and had a good feel for what we were going to have to do. So, dented egos aside, it was time to revise! 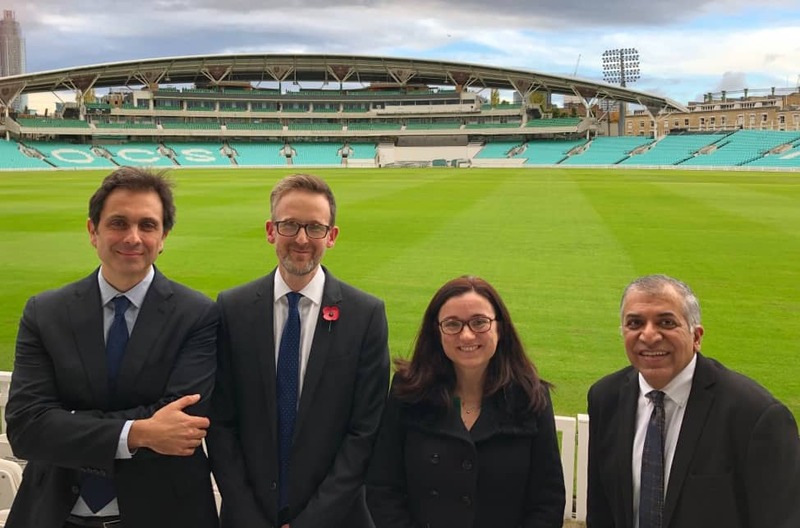 For the real interview, Manuel, Paula, Abhay and myself had to go to the Oval cricket ground – along with the other 200 CDTs who had made it to interview stage. I don’t enjoy interviews, but I do very much like the comradery a team interview can bring. We all arrived in London the night before and rehearsed potential questions and answers, then we had dinner in Jamie’s Italian in Covent garden – here Abhay came up with the lines I had to deliver at the end of the interview – what has become affectionately known to us as ‘the time is right’ speech – that worked so very well on the big day. The next morning, more rehearsal for Manuel, Paula and myself and then off to meet Abhay at the Oval. When we were invited into the room we did feel like comrades and a coherent team. As director I had to give the opening gambit – 2 minutes to explain the CDT – this is the bit I was dreading – 2 minutes, no stumbles, mumbles, freezing or slip ups allowed – went fine. Then the interview – remembering to make the panel laugh, to share the questions around us all, to smile and to be fully engaged when the question was not with us (plus the time is right speech where we did manage to raise some laughs from the interview panel) – 40 minutes in total. Anyway, we all came out knowing we had done well – a really great feeling – still showing I think on our faces in the photo after the interview in the Oval. I always love the feeling of a team overcoming a challenge and doing well; it is such a buzz. (From left) Prof Manuel Salmeron-Sanchez, Prof Matt Dalby, Prof Paula Mendes, Prof Abhay Pandit. Then, the wait….the long wait… for the result. In the end, only 75 CDTs were funded and so more than another 50% went at interview. That the competition was so fierce and the journey so long tells you that the lifETIME CDT will be a great place for you to do a PhD and that the UK needs your skills. We will equip you with the scientific and professional skills you need to be a leader in this field. We welcome diversity, excellence is what we will look for. Glasgow has a saying ‘World-Changers Welcome’ – I hadn’t really thought about this before writing the CDT, now I see clearly this is what we are about – we will welcome you if you have the determination to make a difference. I write this on the train back from the CDT launch event at the Stock Exchange in London. I can’t tell you how proud I am, and we are, that we have the lifETIME CDT. I also can’t tell you how excited I am to meet the first (and subsequent) student cohort/s. We are looking for exceptional talents in engineering, physics, chemistry, maths, life and clinical sciences to join us – to be part of a team who, together, can experience challenges as a team, deliver world-class science and can build the UK non-animal technologies for drug discovery and regenerative medicine sector.